The lean movement has caught fire with entrepreneurs, thanks to Eric Ries, Steve Blank, and Ash Maurya. But how important are concepts such as minimum viable product, customer development and pivoting to larger growth companies? Lean development means creating a successful offer before running out of resources — which is as important to growth companies as it is to startups. As early stage companies mature, the process for creating new offers gets bogged down by internal processes: market requirements documents (MRDs), product review committees, business plans and more. 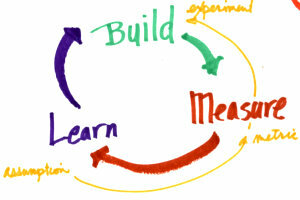 Smart growth companies are using lean concepts to streamline their processes. Being lean is not about being cheap – it’s about speed. If an idea is going to fail it should ‘fail fast’, leaving the company with the market learning, time and resources to try a different approach. The more at bats you can get with limited funding the greater the chance of getting a hit … even better, a home run! … before time runs out. The traditional new product development process has many steps: conduct market research, create a market requirements document (MRD), design and develop an offer, test a beta version with early adopters, limit feature creep, release Rev 1.0, and hope for the best. The time from project launch to real market feedback can be a year or longer. The concept behind the minimum viable product (MVP) is to get into the market as quickly as possible with the most basic offer so that customers can drive decisions about features and business model. How ‘basic’ can this offer be? Dropbox proved that the minimum viable offer can be as basic as a web landing page with a description of a new offer to capture interest and prospect names. Inc Magazine describes a similar MVP approach used by TPGTEX solutions. 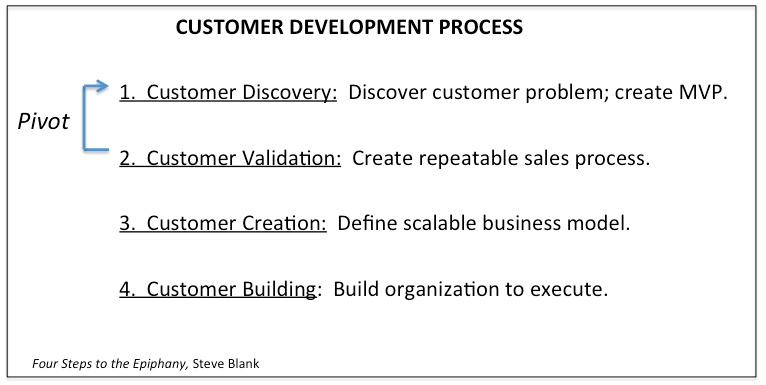 The key is to iterate on Steps 1 and 2 to validate the new offer before investing resources in scaling a new business. This critical step is called the pivot. What happens when customer feedback on your MVP does not support the business model? You pivot. That is, you make one or more changes, grounded in customer learning, to find a better business model. These changes might involve features, market segments, pricing, channel, or other business model elements. A sophisticated version of the pivoting process involves market experiments, or A/B testing. Each experiment provides feedback on what to keep and what to get rid of as the company pivots its way to success. The Nespresso coffer maker and its proprietary coffee capsules were too expensive for either offices or consumers; the business was nearly shutdown. However, by targeting wealthy consumers with a personalized home delivery service (the Nespresso Club), Nespresso found a large growth market in a highly profitable segment. Nearly bankrupt in 2001, Amazon recovered from an over-investment in its worldwide logistics platform by recruiting other retailers such as ToysRUs as customers. Ten years later the company has pivoted its platform business for online retailers into the marketing leading cloud computing service: Amazon Web Services. What steps can growth companies take to become more lean? Shift from MRDs to MVPs. Challenge the new offer team to get into the market much sooner with a very basic offer. Measure customer behavior versus expectations. When it’s clear that the business model isn’t working, pivot while you have the time and resources. “How Growth Companies Can Stay �Lean� | Barriers to Growth”. No matter what I actually appreciated the post! By reading your this blog i actually know what is the reason of business development and i appreciate your work! !